Instead of that same old tie or money clip surprise Dad with our decadently soft Father's day chocolate chip cookie. Perfect for morning brunch or late night snacking. 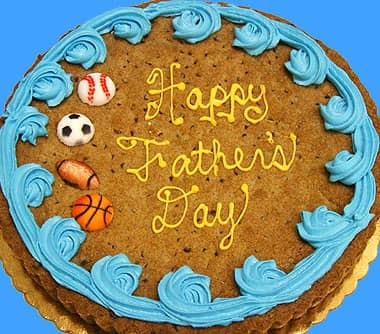 Our Father's Day Cookie is perfect for the dad with a BIG appetite for cookies. It's a giant ten inch cookie filled with chocolate chips, topped with sugar decorations of Dad's favorite sports.